My all-time favorite movie tough guy has left this mortal coil. Here’s a clip of her in the latter — dubbed in French. This is most appropriate as Don Weis’ film (with production design by, of all people, George Hoyningen-Huene) placed him in the Mac-Mahon pantheon. “Soap”? Well if you must the high-priced brand. 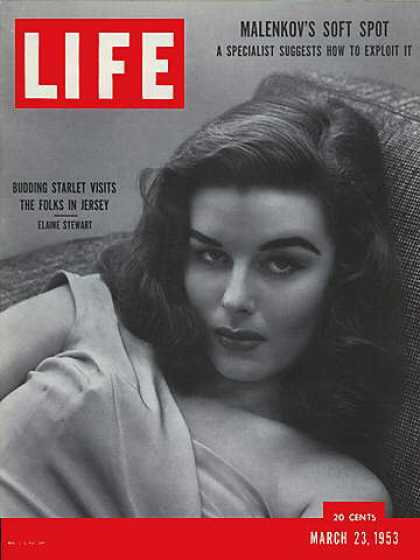 “On Dec. 31, 1964, Stewart married prolific game show creator Merrill Heatter (she earlier was married to actor Bill Carter) and retired from show business to start a family. But in 1972, she returned to TV as the co-hostess of the Heatter-Quigley game show Gambit, and the pairing of Stewart and emcee Wink Martindale gave CBS a daytime hit. Later, Stewart joined Alex Trebek for NBC nighttime game show High Rollers. And here she is at her most magnificent. 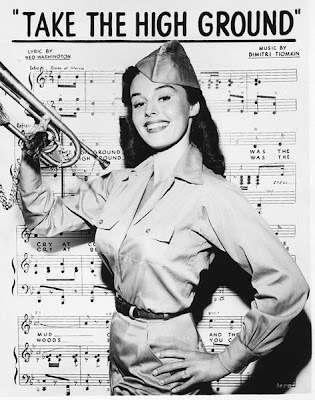 And speaking of “Company,” were Elaine Stewart a singer she would have been ideal for Sondhem.